Partnership enables government agencies to rapidly integrate and analyze large data sets using innovative DataWalk technologies. Palo Alto, California, November 15, 2018 – DataWalk Inc., a provider of analytical software for large scale intelligence-led investigations has added its flagship products to the portfolio of DLT Solutions, the premier government solutions aggregator. This partnership gives federal, state, and local governments a powerful system to integrate data from diverse sources to produce fast and interactive visual analytics showing all activities and connections in support of complex and collaborative investigations. "DLT Solutions is a well-established, highly respected public sector solutions aggregator with the sales, integration, and support experts to deploy our patented technology," said Gabe Gotthard, DataWalk CEO. 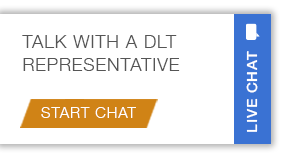 "DLT provides the resources, infrastructure, and contracting avenues to facilitate sales for the large opportunities that benefit from our solutions." "We are very excited to partner with a data analytics leader such as DataWalk," said Brian Strosser, President of DLT. "DataWalk enhances our security, big data, and analytics portfolio, and we look forward to enhancing the public sector’s investigative capabilities with DataWalk’s innovative data analytics technologies. DataWalk is a next-generation analytical platform for revealing patterns, relationships, and anomalies for large-scale, multi-source intelligence operations. Using a massively scalable big-data engine, combined with user-friendly visual interfaces, DataWalk eliminates the restrictions of data silos, allowing agencies to rapidly import and blend data from multiple sources. DataWalk provides a singular data view using intuitive visualizations including histograms, link charts, maps, and timelines for faster intelligence-led decision-making using secure workflows for capturing organizational knowledge and delivering accurate, complete, and consistent results. The company’s patented software technologies power its products and provide breakthrough capabilities to its customers. DataWalk Inc. is headquartered in Palo Alto, California and also has operations in Washington D.C. For more information, visit www.datawalk.com. Established in 1991, DLT accelerates public sector growth for technology companies in the federal, state and local, education, utilities and healthcare markets. As a premier government aggregator, DLT creates value for technology companies by enabling their public sector customers to make smarter technology choices by providing access to a robust network of channel partners and through a broad portfolio of over 40 in-house contract vehicles. DLT’s go-to-market expertise is focused on six core technology domains; Big Data & Analytics, Cybersecurity, Cloud Computing, Application Lifecycle, Business Applications, and IT Infrastructure which are strategically crafted around how our technology partners, customers, and vendors go to market. To learn more, visit our website at www.dlt.com.